What health care will look like after the information technology revolution. The idea that technology will change medicine is as old as the electronic computer itself. Actually, even older. In 1945, Vannevar Bush, the man with the vision for the National Institutes of Health, foresaw a Memex computer program that would allow access to past books and records. A lone physician searching for a diagnosis in far-flung case histories was one of the applications Bush imagined. Medicine is an information intensive industry. Yet there’s still no medical Memex. Even though the Internet teems with health information, study after study shows that medical care often differs greatly from what the guidelines say—when there are guidelines. Doctors frequently rely on their own experience, rather than the experience of millions of patients who have seen thousands of doctors. Not only is the past lost, the present is missing. How many times has a patient received a drug that causes an allergic reaction, just because that information is not available at the time it is needed? Bit by bit, this situation is changing. The 2009 American Recovery and Reinvestment Act (aka the stimulus bill), created the HiTech program, which allocates billions of dollars for doctors and hospitals to buy electronic health records systems. Since the program was enacted, rates of ownership of such systems have tripled among hospitals and quadrupled among physicians. 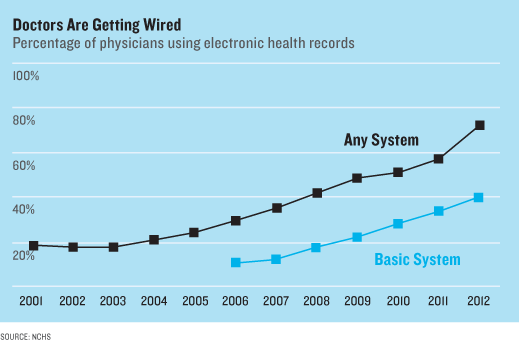 In just a few years, it is reasonable to think that the entire medical system will be wired. What will happen then? The introduction of information technology into the core operations of hospitals and doctors’ offices is likely to make health care much more like the retail sector or financial services. Health care will be provided by big institutions, in a more standardized fashion, with less overall cost, but less of a personal touch. Health care today looks a lot like the retail sector did in the early 1980s, when clothes and household products were sold by many local stores and small chains. Quality was haphazard, prices were higher, and buyers’ experiences were mixed. Consumers had only the information they could see in the store or the Sunday paper. Retail firms got larger when information technology became widespread. Walmart replaced the corner drug store and Amazon put the local book shop out of business because large firms can use information technology better than small ones—to manage inventories, create consistency, automate routine activities, and lower prices. Output per worker grew over 4 percent annually in the retail sector since 1995. Output per worker has fallen in health care over the same time period. When the medical Memex finally arrives, look for health care to follow the retail track. The solo practitioner is likely to be the first to go. He or she will have to decide whether to try to become an IT manager as well as a doctor, or join a larger group of doctors. For most, the choice will be easy. 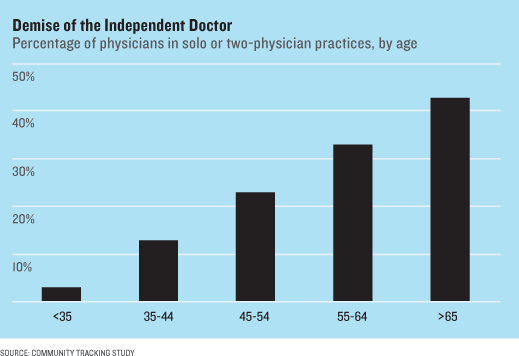 The chance that a doctor over 65 works alone or in a two-person practice is about 40 percent. For young doctors, it’s less than 5 percent. Small hospitals will suffer the same fate. Already, small hospitals that have seen the price tag of medical records systems—$20 million or more to purchase, then millions to maintain—are seeking shelter in the arms of their big neighbors. I suspect most cities will go from 10 to 15 independent institutions a decade ago to three to five large health-care systems a decade hence. These systems will do everything: checkups, nursing the elderly, treating heart failure, and dispensing allergy pills. Who treats us, and where, will change as well. With an electronic backbone in place, one doesn’t need to see a doctor for every issue. There is little the primary care doctor does that can’t—and increasingly isn’t—being done by a nurse practitioner, perhaps at a clinic in a Walmart or CVS. Routine prescriptions for medication refills can be handled online, with an electronic doctor watching. Even high-end services can be spread widely, with specialized centers coördinating the treatment of patients far from its walls. The biggest changes are likely to come from reimagining the role of the patient—the single most underused person in health care. Today, patients are thought of as close to a nuisance (“I told him to take his pills …”). But imagine that the patient was a participant and contributor to the medical Memex. Blood-pressure cuffs can be in the house of every person with high blood pressure; the daily pressure would be transmitted to the doctor’s electronic record and monitored by a computer for outlying values. Decision-support software might allow people with localized cancer to choose between surgery, radiation, and watchful waiting—decisions which are, today, heavily influenced by doctors (and none too objectively). Information technology is going to change the game because it will affect how people view themselves, their illness, and the people who care for them. Amazon’s loyalty comes in no small part because it uses our past searches and the searches of people like us to predict what we will want. The customer is part of Amazon’s Memex. Health care will be less frustrating when the power shifts from sellers to buyers, and when patients are more in charge. Some worry that a health-care system that’s concentrated like retail will drive up costs. But it’s also true that organizational changes are easier when more doctors work together in one system. According to the Institute of Medicine, inappropriate care, lack of adequate prevention, administrative waste, and prices that are too high account for nearly one-third of medical spending. Just the billing and collection operations in health care account for 25 percent of total costs; Walmart and Amazon spend an order of magnitude less on administration. Prices have fallen across the board in the retail sector. Norman Rockwell’s classic painting, “Doctor and the Doll,” is memorable for how the doctor is comforting the little girl by listening to her doll’s heart. Norman Rockwell’s doctor knew everything about the girl and her family. The doctor of the future will not. Rather than being a living electronic record consulting an internal Memex, tomorrow’s doctor will be there to direct patients to the right specialized resources, to reassure those in need, and to comfort the terminally ill. This life may not be as exciting as the surgeons or diagnostic sleuths one sees on TV, but it is a noble calling nonetheless. David Cutler is the Otto Eckstein Professor of Applied Economics at Harvard University and author of the forthcoming, The Quality Cure: How Focusing on Health Care Quality Can Save Your Life and Lower Spending Too. View "Why Medicine Will Be More Like Walmart" and find more technology news from MIT Technology Review.